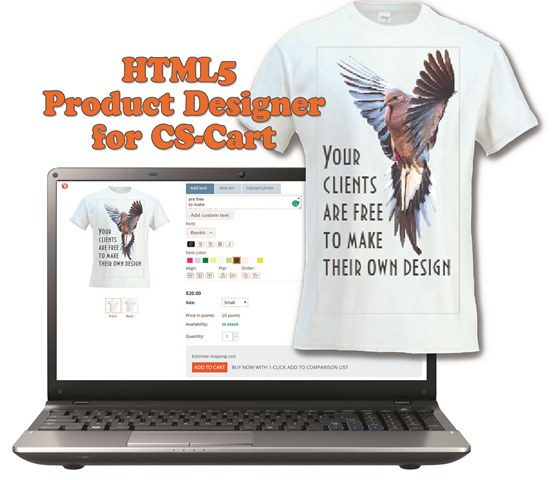 This user guide for HTML5 Product Designer add-on was written to help you get your hand in this web-to-print CS-Cart tool fast and easy. The most important and frequently asked questions are gathered here. We tried to explain the main functions of this customization tool with the help of detailed screenshots and numerous examples. If you do not find the answer to your question after reading this user guide, please, contact our team and we will provide you a comprehensive answer about this web-to-print solution features and solve any problem that connected to our add-on installation or service.